Cambridge, Mass. – May 5, 2015 – Today the Ash Center for Democratic Governance and Innovation at the John F. Kennedy School of Government, Harvard University, announced the Top 10 programs for the Roy and Lila Ash Innovations in Public Engagement in Government Award, including the four finalists who will compete for the $100,000 grand prize on May 20 in Cambridge. In commemoration of its tenth anniversary, the Ash Center is hosting nationally recognized scholars, policymakers, journalists, and artists in a public dialogue series on Challenges to Democracy. The goal of the two-year series is not simply to name the greatest threats facing democracy in the United States today, but to put forward and give due attention to the promising solutions we need. A core element of the Challenges to Democracy series is this special Innovations Award designed specifically to recognize government-led innovations that demonstrate enhanced public engagement and participation in the governance of towns, cities, states, and the nation. These initiatives represent the committed efforts of city, state, and federal governments to engage with the communities and citizens they represent and were selected by a cohort of policy experts, researchers, and practitioners. A full list of the Top 10 programs is available here. 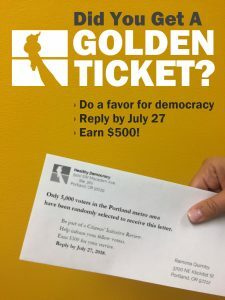 After a 2010 pilot project, in 2011, the Oregon legislature created the Citizens’ Initiative Review Commission (CIRC) to make reviews of citizen ballot measures a permanent part of Oregon elections. The CIRC is comprised of citizen panelists, former moderators, and appointees from the governor and senate leadership. The CIRC selects measures for review and oversees the CIR program. For each CIR, a randomly selected and demographically balanced panel is selected to match the demographics of Oregon’s population with regard to party affiliation, voting frequency, age, gender, ethnicity, educational attainment, and geographic location. Twenty to 24 panelists meet for three to five days to review each ballot measure; to allow citizens from all walks of life to participate, they are compensated for their time and travel expenses. Trained moderators guide the panelists as they gather information, interview neutral policy experts, question pro and con advocates, and deliberate. At the conclusion of each review, panelists draft a “Citizens’ Statement” highlighting the most important findings about the measure and the most relevant arguments for and against its passage. Each statement is published in the Voters’ Guide as an easily accessible resource for voters to use at election time. 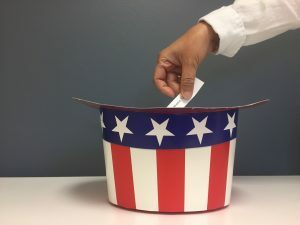 Independent research in 2012 demonstrated that the reviews were unbiased, widely used, and that they helped voters learn more about the ballot measures than other parts of the Voters’ Guide. In response to the Sandy Hook tragedy, President Barack Obama issued a January 2013 directive to the secretaries of the US Department of Health and Human Services and the US Department of Education to launch a national dialogue on mental health. Knowing these dialogues would require an innovative approach to public participation, the Obama administration reached out to experts in deliberative democracy. The result was a partnership of leading organizations in the field that convened a national participation process aimed at helping communities learn more about mental health issues, assess how mental health problems affect their communities and younger populations, and decide what actions to take to improve mental health in their families, schools, and communities. The initiative began with a series of community dialogues and has since extended to online and text-based support in order to reach the youth population often left out of traditional forms of public engagement. The Diversity and Civic Leadership (DCL) Program provides funding and technical support to nongovernmental organizations serving communities of color, as well as immigrant and refugee communities. Its purpose is to build community volunteer capacity to identify issues that impact them, organize strategically, and effectively engage with the city to ensure better outcomes. The DCL Program approach addresses substantial barriers to engagement created by the history of racism in Oregon — and the resulting fear and mistrust of government — by putting resources into the hands of community-led organizations. These organizations build capacity and support civic self-determination in historically under-engaged communities, bringing forth important voices previously missing from the public process. The DCL Program is the culmination of policy discussions starting in the 1990s about Portland’s geographically-based system of neighborhood associations. Participation in these associations, once considered the cornerstone of civic engagement in Portland, was largely static, even as Portland demographics changed and Portland became one of the top 10 refugee resettlement cities in the US. In 2007, the greater Eau Claire area confronted major fiscal and public-service decisions about funding for over $400 million in community facilities needs for schools, performing arts facilities, libraries, courthouse expansions, sewer plants, parks, and downtown revitalization. In an effort to address these needs, local government officials convened an ad hoc group of government, business, education, and nonprofit leaders in March of that year to discuss how the community could work together more effectively. Partnering with the National Civic League, the group embarked on an inclusive, citizen-centered community visioning and strategic planning process. Over 500 diverse stakeholders were invited to participate in the kickoff to the Clear Vision Eau Claire process, whose mission statement was “to engage our community for the common good.” Working also with the Center for Democracy and Citizenship at Augsburg College, Clear Vision created a model for civic engagement and public problem-solving that brings together everyday people and public leaders in collaborative work. The results in Eau Claire include a community homeless shelter, neighborhood community gardens, youth environmental action teams, and, most recently, approval of a $70 million, public-private joint venture performing arts center and downtown revitalization project, and future plans for a major events and recreation complex. San Francisco’s Neighborhood Empowerment Network (NEN) streamlines neighborhood stakeholders’ access to resources that increase their capacity to create and implement culturally competent Resilience Action Plans that guide their community’s investments to mitigate the impact of times of stress, such as earthquakes and powerful storm surges, and recover quickly. The NEN, which is comprised of city agencies, nonprofits, academic institutions, faith-based and neighborhood organizations, foundations, and private sector stakeholders, disrupts the traditional top-down approach towards disaster resilience through its Empowered Communities Program, which integrates strategies such as human-centered design, collective impact, and leadership development into a unifying community development experience. Learn more at empowersf.org. The NY Rising Community Reconstruction (NYRCR) Program is a participatory recovery and resiliency initiative established to provide assistance to 124 communities severely damaged by Superstorm Sandy, Hurricane Irene, and Tropical Storm Lee. The Governor’s Office of Storm Recovery (GOSR) has allotted more than $700 million in federal funds to support the planning and implementation of community-developed projects. Unlike traditional top-down approaches to disaster recovery, the NYRCR Program directly engages local residents and business owners in a democratic, bottom-up approach to rebuilding communities in a resilient manner. Across New York State, more than 650 New Yorkers have represented their communities by serving on planning committees. More than 650 planning committee meetings and 250 larger scale public engagement events have been held, during which community members worked with the state’s team to develop community reconstruction plans that identify opportunities to make their communities physically, economically, and socially more resilient. The NYRCR Program’s outreach has included communities that are traditionally underrepresented, such as immigrant populations and students. The NYRCR Program is now working with local partners to implement recovery and resiliency projects proposed in the NYRCR Plans. In most cases, projects will be implemented by local governments and qualified nonprofit organizations, with support and technical assistance provided by GOSR. Oregon’s Kitchen Table helps connect elected officials and the public in Oregon in joint projects at nearly every scale (state, regional, local, and even individual) through public consultations, in-person events, civic crowdfunding, and Oregonian-to-Oregonian micro-lending. The program was founded in 2010 at Portland State University by a group of nonprofit community leaders and former elected officials in order to create a permanent civic infrastructure through which Oregonians can access a suite of different opportunities for civic engagement. Each Oregon’s Kitchen Table project includes organizing and outreach components to generate participation from Oregonians. Participatory budgeting is a community-level democratic approach to public spending in which local people directly decide how to allocate public funding. Participatory Budgeting in New York City (PBNYC), called “revolutionary civics in action” by the New York Times, is the largest and the fastest-growing participatory budgeting process in the United States. PBNYC’s cycle lasts eight months, beginning with thousands of people attending hundreds of neighborhood assemblies to brainstorm spending ideas that could improve their communities. Hundreds become “budget delegates” and work with their neighbors, elected officials, city agencies and community organizations to create project proposals. This year, more than 40,000 people voted on the projects they want to see in their communities. Winning proposals — such as new computers for underserved public schools, public park renovations, and pedestrian safety improvements — are funded and implemented by the city. Vallejo’s Participatory Budgeting (PB) is an annual nine-month process of reestablishing citizen trust in their government, incorporating residents’ creativity into project design, and collaborating across demographic and bureaucratic boundaries. Now in its third year, residents come together at schools, community centers, and places of worship to share hundreds of ideas to improve their city — one of the most diverse in the US. Volunteers work closely with city staff to sift, combine, adapt, and develop those ideas into project proposals. A special election provides every resident 16 years and older with an opportunity to vote on which projects to fund with local sales tax revenue. The city’s annual event engages nearly 5,000 residents, many of whom are not yet 18 years old. Not only does Vallejo and its population of 115,000 benefit from the 20+ public projects totaling $5.6 million, it creates an opportunity for hundreds more “professional citizens” to sit at the table alongside civil service employees and elected officials to become real stakeholders and decision-makers in their government. The Textizen platform was originally conceived in 2011 via a partnership between the Philadelphia Mayor’s Office of New Urban Mechanics, the Philadelphia City Planning Commission, and the national nonprofit Code for America as a means to open up public participation in the Philadelphia2035 long-term planning effort to anyone with a cell phone. The standard mode of public engagement is to schedule meetings, notify all potential participants, and hope for representative turnout as well as candid and useful feedback. From this standard process, the average number of participants per Philadelphia2035 district meeting was 100; given that a district can have 85,000 inhabitants, this left much to be desired. The text message medium permits anyone with a cell phone to participate, not just those with smartphones or Internet access. It is also inexpensive for users, and sees high use among low-income populations.